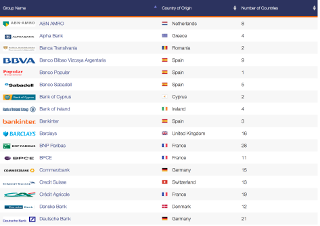 Banks by Country is a starting point to navigate TheBanks.eu bank directory, containing profiles of about 8,000 banks operating in Europe and selected dependent terriroties of the European countries. 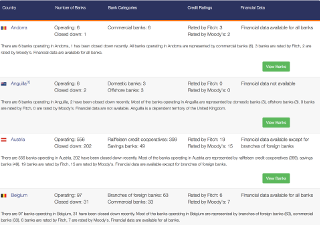 The bank profiles contain business overview, key financial data, credit ratings (if assigned), deposit guarantee, contact details, and bank identifiers. 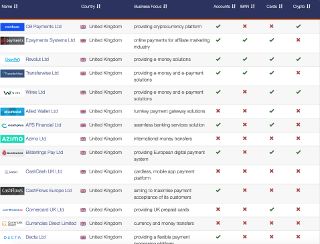 "Banks by Country" page provides further navigation into lists of banks in particular countries. Bank Search allows to find a bank using a part of its name or BIC code, or a country name. 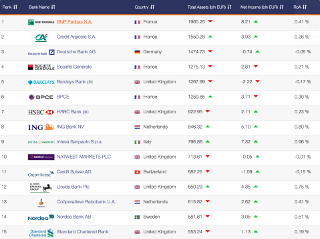 Largest Banks in Europe page contains a list of 30 largest European banks in terms of total assets. 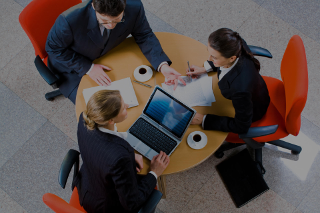 Banking Groups page contains information about European banking groups including provided services, area served, head bank, group brands and group members located in Europe. Top Rated Banks is a list of European banks having the highest credit ratings assigned by Fitch and Moody's. Long-term credit ratings (i.e., a credit rating agency's view of a banks’s relative vulnerability to default on its financial obligations in a long-term period) are shown. An electronic money institution (EMI) is an undertaking that has been authorised to issue e-money. E-money institutions (EMIs) offer a wide range of products, services and solutions in payment processing and alternative banking, ranging from merchant accounts and cross-border money transfers to elite payment cards and private banking approach to corporate clients.